Great dip recipe: Beat cream cheese until creamy, place in dish and spoon pepper jelly over it. Great for crackers, potato chips, or tortilla chips. quart jars. Pack cucumbers in jars, leaving 1/2 inch head-space. Cover with boiling brine, leaving 1/2 inch head-space. Wipe rims of jars. Seal and process in boiling water bath 10 minutes. Yield: About 6 quarts. Cut oranges and lemon.in half and squeeze out the juice, saving it...Put seeds in a cheesecloth bag. Coarsely slice and chop the fruit skins, leave the pith intact...Place fruit skins, juice, bag of seeds and water in saucepan, bring to a boil slowly simmer for about 2 hours or until the skins are soft. Add sugar and stir until dissolved. Take out the cheesecloth and squeeze the juice into the saucepan. Bring to a boil, and boil rapidly for 15-20 minutes, or until setting point is reached. This would be when it is thickened. Remove from heat and let it cool slightly. Ladle into sterilized jars, seal with sterilized seals and lids. Label when jars have cooled. Wash cabbage (chlorinated tap water not advised), drain, cut up in 1 inch pieces. Mix with other vegetables in large bowl, mixing and crushing with clean hands. Layer cabbage/veg in crock or large jar. Sprinkle with salt, continue layering. Press down, add weight or plastic bag filled with water to keep covered in liquid, leaving plenty of head space, cover loosely with plastic wrap and lid. Juice will continue to expand, so sit it in a bowl to catch liquid. When wilted and fermented add seasoning as desired. Keep out of refrigerator until after you've eaten out of it. Approx. one week. Sweet 'n Spicy Pickles, my version of Wickles Pickles. boil and boil for 1 minute. Remove from heat. Pour jam into 2 half pint jars with tight fitting lids. Cover and refrigerate until jam is set and cold. Keep refrigerated and use within 3 weeks. Split cucumbers lengthwise. Add the salt to the boiling water and pour it over the cucumbers. Let it stand one week. 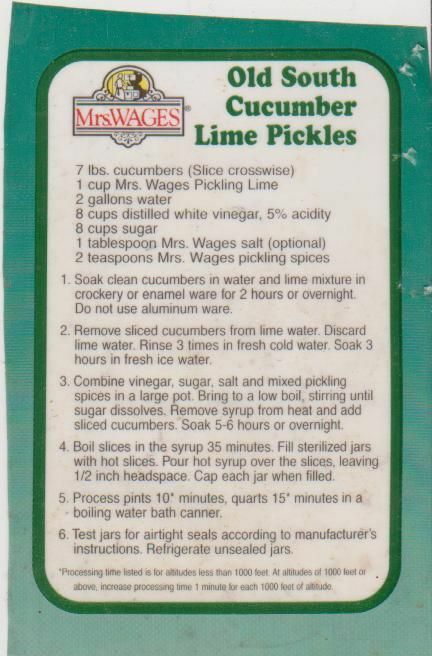 After a week, drain the cucumbers, cover them with the boiling water again and let stand twenty-four hours.m Then drain, dissolve the alum in boiling water and pour it over the pickles. Let stand twenty-four hours. Then drain the pickles and take two quarts of vinegar and four quarts of sugar plus all the spices and boil them together. Pour this mixture over the pickles. Repeat this for four mornings, each time pouring off the liquid, boiling it again and pouring it back over the pickles boiling hot. Seal the pickles in a can.